From "Young Egyptians Spread Their Message." Ed Ou for the New York Times. I photographed Steve Jobs once. Some time in ’86 or ’87. Jobs was in a suite at the St. Regis in New York pushing NeXT computers. I remember getting there early and watching him prep. I don’t have the photos (my employer owned them) and at the time I didn’t think to grab some of the extra prints. Maybe that says something… I saved odds and ends: Mario Cuomo at the opening of the Javits Center; Joe Raposo, Judy Collins, and a cat at a Purina Cat Chow event in Lincoln Center; Fred Flintstone and Barney Rubble in Fred’s car for AAA; Spanky from the Little Rascals promoting the Little Rascal motorized scooter. But no Steve Jobs. I spent the 90’s with a shared NEC PC and then a couple of Dells until I hit a wall. A custom Dell configuration failed me. It couldn’t support a few scanners and an early digital camera. Many emails back and forth with Dell, including a couple from Michael Dell (yes, times were different then) and it turned out that Dell had not vetted the computer completely. They could not fix the issues and they could not recommend an alternative. At that point, about 1997, my Mac odyssey began. In thinking about how much my iPhone has integrated with my DNA and in how much I couldn’t survive without my Mac Pro or my MacBook Pro when working on location, it’s actually two other thoughts which come to mind with Jobs’ passing. This past year with the Arab Spring, demonstrations, and calls for democracy; it was common to see photos where in the mix of all that was happening a Mac laptop or an iPhone was present. Jobs must have seen these, the two examples here were on front pages of the New York Times, and he must have seen in them a culmination of his vision to truly *change the world. It wasn’t just about changing the culture in the United States or making a profit. It was about giving the world the tools to institute change. My other thought is to my personal experience in switching from PCs to Macs and how, with hindsight, it shows what has always been at Apple’s core – the user experience. When I got my first Power Mac not only did it run all my peripherals seamlessly but when you opened it up it was a sight to behold. Brushed metal on the inside with slight circular patterns to it. Everything neatly arranged and easy accessible. It was the opposite of my PC experience. Going inside a PC was like trying to find your way through the back room of a storage facility. The think different here was Apple recognizing that a Power Mac user was going to open it up, otherwise they wouldn’t need a Power Mac. So, Apple made the experience positive – aesthetically and functionally. Young Egyptians Spread Their Message from the New York Times. The photo ran on the front page, above the fold, on February 9, 2011. 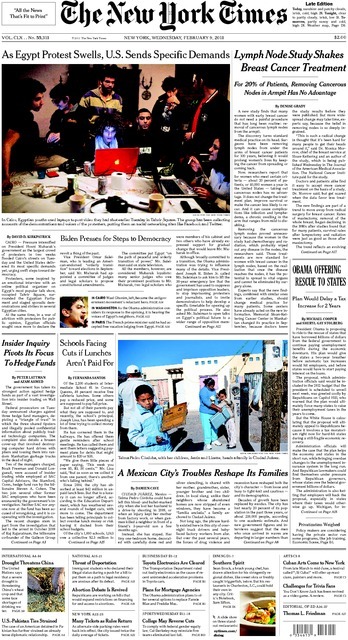 US Underwrites Internet Detour Around Censors, from the New York Times. 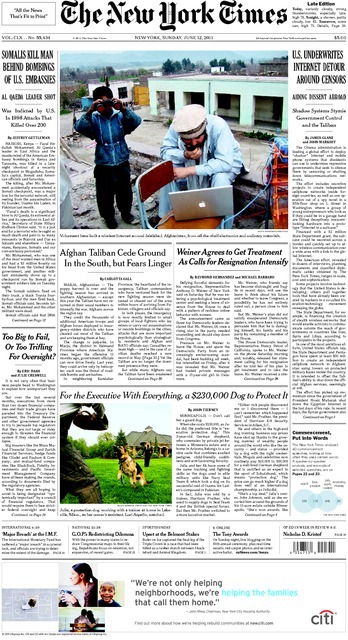 The photo ran on the front page, above the fold, on June 12, 2011.